Former gang member Abraham Colunga recalls the morning he was arrested for violating an order prohibiting gang members from associating with other gang members. He said he was walking his daughter to school when he was suddenly taken into custody by police. His alleged crime? Being asked by a neighbor sitting in a police patrol car to notify his family that he had been arrested, a violation of a South Gate gang injunction. He says the short conversation led to his arrest. “…I was taken to jail for 90 days,” he said during a forum in Highland Park last week where panelists debated the value of gang injunctions as a crime fighting tool. Colunga says gang injunctions make it harder for gang members to turn their lives around, to get jobs, or to even be with family. Panelists, representing the Los Angeles City Attorney’s office, Los Angeles Police Department, the American Civil Liberties Union (ACLU), gang intervention programs as well as two former gang members, all agreed gang violence is a serious problem, each coming at the issue from the unique perspective of their jobs and what they’ve experienced. 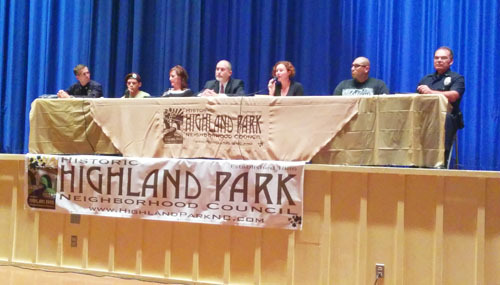 The forum, hosted by the Historic Highland Park Neighborhood Council, was held at Franklin High School. It comes on the heels of a recent surge in gang related shootings in Northeast Los Angeles. Capt. Jeffrey Bert with LAPD’s northeast division attributed the rising violence to feuding between the Avenues and HLP gangs in Highland Park. So far this year, gang related crime is up 67% compared to last year, Bert said. There were 20 shootings between Avenues and Highland Park between February 6, 2015 and April 18, 2015; some of the victims were innocent bystanders. In response, LAPD has stepped up the number of officers patrolling the area as some residents call for greater gang suppression tactics. Gang injunctions are such a tool, said City Attorney Arturo Martinez, who explained injunctions are civil court orders prohibiting gang members from congregating with each other or committing crimes on behalf of the gang enterprise. Considered by law enforcement to be one of the most effective legal gang suppression tools, gang injunctions detail activities that are restricted in a an identified gang territory, such as tagging, selling or possessing drugs or a gun, drinking in public or staying out after an imposed curfew: all activities one panelists said are already crimes and don’t need a gang injunction to be considered illegal. There are currently more than 46 permanent gang injunctions in place in Los Angeles, according to the City Attorney’s website. Three target gangs in Highland Park: Avenues, HLP and Dogtown. How gang injunctions are obtained and enforced has changed over the years in response to what they’ve learned, explained Martinez. He said the department no longer lists the names of believed gang members on the injunctions. Instead, they target the gang as a criminal entity, similar to what the federal government did with the Mafia. To convict someone of a gang injunction violation, there must be sufficient evidence proving the person acted in a way that benefits the gang and harms the community. “We have served 504 members of Avenues since April 2003, 51 members of Dogtown since January 2009, and 141 members of Highland Park since December of 2006,” and that contributed to the large drop in crime we had before now, Capt. Bert said. Catherine Wagner of the Southern California Chapter of the ACLU said gang injunctions violate an individual’s right to due process. She said some people don’t know they are subject to the injunction until they are arrested for violating a misdemeanor and have to prove in court why the gang injunction should not apply to them. The process “puts the burden on the individual to prove he or she is not a gang member” when it should be the government proving it has cause to curtail your rights, Wagner said. She said the injunctions criminalize activities most people take for granted, like visiting a family member in the hospital or going to a park, even when there is no evidence of illegal activity going on, and that’s wrong. According to Alba S. Cerda, director of youth violence and gang prevention with Childrens Hospital Los Angeles, there is a strong disconnect between whether a person thinks of them self as a gang member and what law enforcement thinks. Young people living in a neighborhood with a strong gang presence will know gang members, they may even be friendly and associate publicly with them, or live in the same house, she said. But that doesn’t mean they consider themselves a member of the gang or are engaged in criminal activity or doing the gang’s bidding, she said, explaining the dynamics are very complex. “Gang injunctions in the City of LA are permanent. Violating the terms of the injunction is a criminal misdemeanor punishable by up to 6 months in jail and/or $1,000 fine,” Rob Wilcox, director of community engagement and outreach for the City Attorney’s office told EGP via email. During the forum however, Martinez said there is a process for removing one’s self from the injunction order, starting with an application on the city attorney’s website. To date, 130 people have applied for removal. Wilcox said the process takes some time to complete and can vary case to case depending on how long it takes to vet the information submitted. Cerda sees gangs as a public health issue that needs to be solved, not with restraining orders, but with prevention and guidance. She said poverty and quality of life issues contribute to gang involvement. Ninety percent of the families her program serves don’t have transportation; as many as five or six people share a one bedroom apartment, she said. “Law enforcement strategies are inadequate, there has to be a balance” between prevention and enforcement, she said. “Youth 10-15 are the most vulnerable,” either because they come from multi-generational gang member families or due to the extreme poverty, Cerda said. They suffer from post-traumatic stress syndrome; … from being in a home where a raid takes place, Cerda said. “We need to invest as much as we can” to keep young people out of jail, agreed Bert. LAPD Northeast Division Lt. John Cook applauds organizations like Aztecs Rising in Lincoln Heights that provide prevention and intervention service in the northeast area. L.A. recently approved an additional $5.5 million for Gang Reduction Youth Development (GRYD) programs. Gemma Marquez teaches at Burbank Middle School and told EGP that meetings that only give out statistics are worthless. She hopes LAPD participates more with the community and provides real resources. Citing his work with Childrens Hospital and other community groups working on prevention, Bert said northeast police are working to build partnerships in the community. But there’s no denying that gang injunctions are still an important law enforcement tool that is helping LAPD suppress gang activity, he added. “It’s very easy to call about crime, but it’s harder to fight it,” said Bert. Worried about a rash of gang-related shootings in their neighborhood, residents packed a meeting at the Highland Park Senior Center Thursday night to hear what police are doing to get the situation under control. A turf war between two rival gangs – Avenues and HLP – is being blamed for the 13 shootings, 9 people shot, in less than two months. Not all the victims were gang members, said Capt. Anthony Oddo of the Los Angeles Police Dept. Northeast Division. He pointed out the boldness of the shootings, several which took place in broad daylight with many people around. The Historic Highland Park Neighborhood Council hosted the meeting, with representatives of the two city council districts that cover the area, CD-1 and CD-14, LAPD Police Commissioner Sandra Figueroa-Villa, Supervisor Hilda Solis and the city attorney’s office in attendance. Ranking officers assigned to the Los Angeles Police Department’s Northeast Division were out in force and did most of the talking, answering questions and taking criticism from residents. Northeast police know there is a problem and we are getting reinforcements, including more patrol units and special teams from other areas, Oddo said. But we are getting very little information from the public about the shootings and none of the shooters are in custody, he said. “Victims are not talking to us … they are not gang members; they’re scared,” the captain said, adding the department needs the public’s help to stop the shootings. There has been 105 arrests in the Highland Park area during the same period, but none have led to the shooters, he said, but he’s hopeful one may still lead to a suspect. You may not be sure if it’s important, but the smallest bit of information, things heard from other people can be looked into and may lead somewhere, he said, urging people to call police with any information they may have. Several residents complained they’ve seen this coming for some time, noting the increase in graffiti and “cross outs,” the practice of one gang crossing out the tag of a rival, which often leads to violent retaliation. They say they call the graffiti in right away to get cleaned up to try to stop the violence that could come next, but wanted to know what else they could do. Call in what you see, get to know your neighbors, form a neighborhood watch, were among the suggestions. “We cannot do this alone, we need the community to get involved,” officers said. Residents say they are worried AB 109 and the governor’s prison realignment, and passage of Proposition 47, are sending criminals released early from jail back into their neighborhood. One speaker said gang members are hanging out at homeless encampments and she’s heard the homeless are being paid with drugs to burglarize local homes and cars. Resident Richard Marquez said it’s time to stop dancing around and talk about the real issue: Highland Park has a big problem with meth dealers and users, and it’s big money. “Meth dealers pay taxes to gang members” and the way to stop the shootings is to shut down the drug trade, he said. “There’s a fight for the financial gain of the drug turf in the neighborhoods,” Marquez said. Lt. John Cook is in charge of Northeast’s gang reduction unit and said they are closely monitoring the gang members coming out of jail. Are there still gang injunctions in place? someone asked. There are three gang injunctions—a court-issued restraining order prohibiting known gang members from congregating with each other— in place, (Avenues, Dogtown, HLP), but they don’t apply to new gang members, according to Cook. Former Highland Park resident Lily Herrera said she is worried about her mother who still lives in the neighborhood. Years of mistrust of the police by residents is keeping people from saying what they know. “The community is afraid because there’s a barrier” when it comes to communication, she said. She suggested LAPD explore more strategies to reach out to the community. Teacher Gemma Marquez demanded to know why police are not regularly visiting local elementary schools to develop those relationships. “We know who the at-risk kids are,” she said. “We know the families, we see them as early as kindergarten,” and the police need to present a different view. Oddo apologized for not considering students were still at the afterschool program at 5 p.m. when the shooting occurred. LAPD has “very little coming in” from the community and that’s frustrating, said Oddo. He said his top priority is the violence in the Northeast, but said he needs people to call them when they see something. Two upcoming events will provide more information and resources to the community: the Annual Peace in the Northeast March and Resource Fair on April 18, and a forum on gang injunctions April 30 at the Highland Park Senior Center. Updated 04-06-15 to add LAPD Commissioner Sandra Figueroa-Villa attended the meeting.